You’ve heard the familiar adage, “the devil is in the details.” Well, last week, I experienced quite the opposite—the yin to that yang—as so often occurs with such idioms. Truth is, I discovered the Divine in the details. Last weekend, I had the opportunity to attend Art @ Mo—a rejuvenating week combining spirituality and fellowship with a healthy helping of creative nourishment—all served up in the midst of the most idyllic scenery Texas has to offer. It was a confluence beyond compare. How fortunate I was to spend five days of serenity and regeneration in the cradle of the majestic Texas Hill Country outside of San Antonio. I have been to Mo Ranch more times than I can count— with and without my boys, but this year was a completely different experience. I allowed myself to focus completely and unapologetically on the art of jewelry-making, and I’m not just talking about stringing some purple beads and tying a knot (which I have been known to do and to enjoy). This was the real deal, the artisan craft, and I never knew how liberating and captivating such a pursuit could be. It involved intense study of the painstaking steps and discipline required to make metal jewelry from concept to creation—using fine materials, such as copper, agate, abalone, amethyst, and the like. In addition to producing some wonderful pieces under the tutelage of master jeweler Jean Cofer, I learned some lessons that have given me insight and even a sense of peace and enlightenment in my life as a whole. This brings me to—the pickle. Pickle is the solution used during jewelry construction to clean away the oxides, imperfections, and discolorations that occur during the prep and soldering process. (I will describe this in greater detail in a moment.) It’s kind of a noxious brew of hydrochloric acid and water heated in crock pot or “cauldron.” It’ll take your skin right off, but damn, it makes gorgeous jewelry!! As neophytes, needless to say, we mostly treated the pickle with great respect. Even using the wrong implement, such as aluminum tweezers, could cause a chemical reaction and contaminate it instantly. We were careful to use wooden dowels or copper tweezers. One brazen classmate threw an old door knob or something in the pickle one day, and the cloud of foul, sulfur-smelling gas that enveloped the room required our immediate evacuation. Jewelry-making is not for the timid! Of course, sometimes you may decide you want the earthy patina that only contaminated pickle can deliver. Then, it’s more about the art than the science. I’ve always wanted to learn to solder — the process of joining metal using an alloy designed to melt at a temperature lower than the metal base. Both pieces must be heated simultaneously until the solder melts. Upon cooling, the solder solidifies to form a firm, lasting joint. The levels of solder are termed extra easy, easy, medium. and hard—depending on their melting points. Typically, they are used in reverse progression on a given piece. It gets pretty complicated. Then, you actually use a gas blowtorch that you ignite with a bang and flourish on top of a brick. (That’s pretty fun.) You can use a small piece of screen perched atop a six-inch-tall, three-legged stand to perform what’s called a “sweat” solder. And boy, it’s hot. I find soldering truly a mystical, hypnotic process as you wave the glowing torch in back and fort and in a rotating motion over your work — waiting for the glisten of the shiny silver alloy to “pop” and ooze. Thinking of that Scottish play, “Bubble, bubble toil and trouble . . . ” kind of an everyday alchemy. You heat your carefully wrought jewel one step at a time—avoiding over-heating and/or complete incineration but cajoling and coaxing in carefully and gingerly to “flow.” Jean, our wonderful teacher, demonstrated how to almost caress the piece of jewelry with the flame and “fluff it” just enough to achieve the desired response at the appropriate moment. The irony is that the pendant, ring or bracelet turns the blackest black, literally soot-encrusted and then seems to almost undulate with rainbow waves of color rolling and rippling across the once-shiny surface. Magic. In addition to the mesmerizing beauty of it all, the process struck me as such a basic metaphor for life’s challenges—the reality of going through the most intense heat, pain and darkness to transform into a beautiful, bright work of art. Even the terms to describe the different types of solder fit the analogy – sometimes it’s “easy,” even “extra easy” to stay “in flow,” and sometimes it’s pretty “hard,” and we get stuck. So, we start all over again. The key learning for me was that every step is essential. No skipping this or that to speed up the process for us impatient, big-picture types. Trust the process. Hmmm . . . Seems I’ve heard that one before. This was the spiritual gateway for me –where I was able to leave behind all the “recent character-building” experiences of my Dallas life and find a renewed sense of feeling centered and at peace. The Zen of soldering, indeed. Each step is a piece of the puzzle. Like “flux” – the substance you must always use in soldering to facilitate the flow and the bond. Now, that is poetry right there. It’s all about the steps and sequencing. Very instructive stuff on my latest enlightenment journey. Plus, I walked away with treasures I am proud to own and wear—along with memories of laughter and song. Win-win-win. 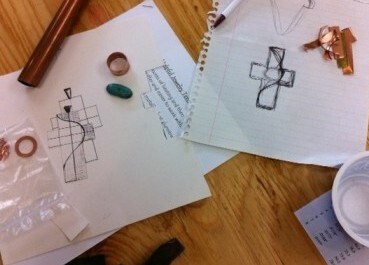 Next up: Annealing and Praying . . . don’t you love it? Thanks so much for the kind words! I’m so glad you had a memorable experience. I loved being at Mo with you girls and can’t wait until next year! My pleasure, Jean. You totally rock! Can’t wait until next year. Was the highlight of my summer. . . Yes, Jean is a master jeweler, designer, and a great lady to hang around. 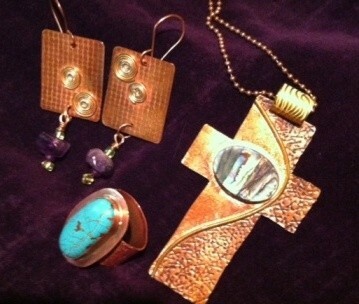 I love your comparison of jewelry making and our earthly growth experience with a spiritual spin. Creating comes from our Creator! Liz, thank you so much for the kind comment. I attribute the inspiration to Jean, the “jewelry whisperer.” Very grateful our paths have crossed.